Bass Management: Sharpen, Define, Align & Anchor. When solid or natural sounding bass is a requirement in your recording projects, Monofilter provides the foundation for real power and definition. 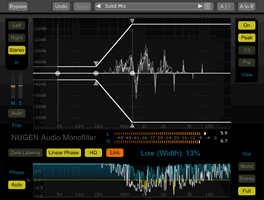 Sharpen, define and align for the tightest mix using Monofilter in every track. With presets for every situation and controls for fine tuning to perfection, Monofilter anchors your bass with ease. The non-directional nature of low frequencies can contribute to a lack of clarity and focus in the mix. Adding stereo FX or using multiple mic. set-ups in the studio can introduce phase inconsistencies leading to 'weak', 'hollow' or 'flat' sounds. • Fix samples or restore old recordings. 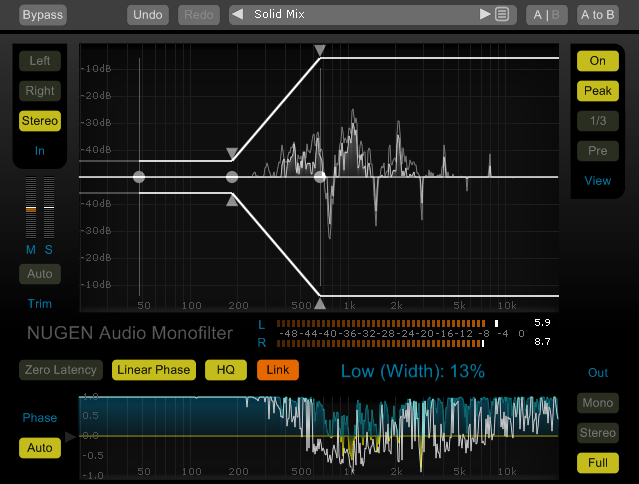 "Monofilter immediately added clarity and focus to my bass lines. The interface is so user friendly. The filters add a warm characteristic that I have yet to find anywhere else." Precise low end phase alignment. 'Auto' level trim and phase control. Linear phase High Pass filter. Real-time correlation by frequency analysis.